England coach Brian Ashton has dropped Jonny Wilkinson in favour of Danny Cipriani for this weekend's Six Nations clash with Ireland at Twickenham. The fly-half superstar, who kicked England to 2003 World Cup glory, will be on the bench and replaced by 20-year-old Danny Cipriani. Wilkinson, capped 69 times, pays the price following a poor display during England's 15-9 Calcutta Cup defeat to Scotland in Edinburgh three days ago. Amazingly though, it is the solitary change as England head coach Brian Ashton gives his players a completely undeserved vote of confidence. And Wilkinson will now be seen as something of a scapegoat, which is harsh on him in the extreme. 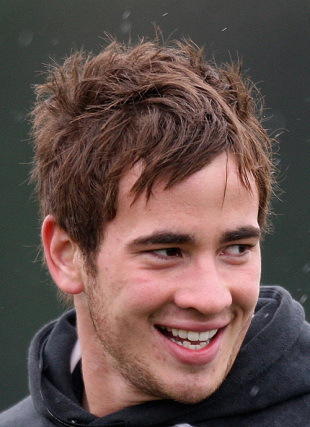 Gifted Cipriani is viewed as Wilkinson's heir-apparent in the England number 10 shirt. Wilkinson was overlooked for England's 1999 World Cup quarter-final against South Africa in favour of Paul Grayson. That though, was viewed as a horses for courses selection, whereas on this occasion he has arguably been dropped purely on a loss of form. Cipriani makes an immediate return to the side after being selected at full-back for the Scotland clash - then axed by Ashton when he was pictured leaving a London night-spot after midnight last Thursday. Ashton's decision received widespread condemnation, with former England chief Sir Clive Woodward among those who criticised his handling of Cipriani. But Cipriani is now given a belated first Test start in a side that remarkably shows no other switches following the Scotland shocker. There are two changes on the bench, where fit-again flanker James Haskell takes over from Luke Narraway and Wilkinson features instead of Charlie Hodgson, but Ashton has stopped there. Wing Lesley Vainikolo can be among those considered fortunate to escape, yet Ashton has given the players who got England into such a sorry mess an opportunity to get them out of it. Wilkinson made his England debut against Ireland 10 years ago, and he broke Neil Jenkins' world Test points record of 1090 for Wales and the Lions at Murrayfield when he kicked the first of three successful penalties. But his general play, notably tactical direction and kicking from hand, fell way below standard, leaving Ashton with little option but to consider fly-half alternatives. It is unlikely to spell the end of 28-year-old Wilkinson's illustrious England reign, but Cipriani can now make a major statement. Ashton will look to Cipriani for the creative spark so badly lacking during a Six Nations campaign that has horribly misfired. And if he provides it, then he will be in pole position for England's daunting two-Test tour to New Zealand this summer. England though, have struggled through another Six Nations season that will see Wales or France crowned champions in Cardiff later this week. England have not lifted Six Nations silverware since their Grand Slam-winning campaign in 2003, and vultures are circling over Ashton. His team has to beat a similarly under-performing Irish side, or he will face renewed - and inevitably more strident - calls for his departure. Ashton has taken charge of England in 21 Tests since he succeeded Andy Robinson almost 15 months ago, losing 10 of those, although he did oversee a World Cup final appearance against all odds last October. Ireland coach Eddie O'Sullivan has named Ronan O'Gara as captain of the Ireland team to play England in the RBS Six Nations Championship this weekend. O'Sullivan has opted for the Munster fly-half after Brian O'Driscoll was ruled out with the hamstring tear incurred in the 16-12 defeat by Wales. It will be the first time O'Gara has led the national side, pipping provincial colleague and captain Paul O'Connell to the job. O'Connell has filled the role in O'Driscoll's absence in the past but the Lions lock has been overlooked as Ireland seek a third successive victory at Twickenham. Geordan Murphy has been pencilled in at full-back after nearing rehabilitation from his Achilles problem. Murphy missed out against Wales with the injury he sustained on club duty for Leicester and faces a fitness test later in the week to confirm his selection. His return forces Rob Kearney, who deputised at Croke Park on Saturday, back onto the left wing, with Tommy Bowe switching over to his preferred position on the right. As expected, Shane Horgan of Leinster has been shifted to inside centre in response to O'Driscoll's torn hamstring. Ulster's Andrew Trimble moves a place down the line to outside centre to accommodate Horgan, with the duo forcing Ireland's third new-look midfield of this year's Six Nations. Twickenham may have been a happy hunting ground for Ireland in recent times but defeat on Saturday would represent their worst performance in the championship since 1999. O'Sullivan revealed O'Connell was not disgruntled at the decision to hand O'Gara the captaincy. He said: ''The call was made on the basis Paul has been out for a while and has only one game of Six Nations rugby under his belt this season. Murphy's fitness will be monitored throughout the week and O'Sullivan admitted a doubt still hangs over the Leicester full-back. Centre Flood will go into battle after openly admitting he has endured one of the worst weeks in his life. He experienced defeat against Scotland, then saw his Newcastle and England colleague Jonny Wilkinson dropped before club boss and mentor John Fletcher parted company with the Falcons. Flood, who also has an on-going knee problem, will need to dig deep, although at least he will not have to worry about injured Ireland captain Brian O'Driscoll. The versatile Horgan has moved into midfield, and he rarely plays poorly against England, giving Flood something else to think about. Will new England fly-half Cipriani go from zero to hero after being handed the number 10 shirt normally worn with distinction by an axed Jonny Wilkinson? Ditched before the Scotland game when he was pictured leaving a London nightspot barely 60 hours before kick-off, he is now charged with spearheading an England win. Opposite number O'Gara has been handed the Ireland captaincy instead of an absent O'Driscoll, and he unquestionably poses the biggest single threat to England. A master tactician and brilliant kicker, he possesses the ability to drive his team towards a third successive Twickenham triumph. Powerhouse prop Sheridan was at his indestructible best during England's victory over France in Paris last month, but he allowed the Scottish forwards - notably lock Nathan Hines - to rile him at Murrayfield and get under his skin. England will need Sheridan to rediscover maximum efficiency and provide a critical edge up-front, but Ireland tighthead Hayes, who wins his 84th cap to move second above Brian O'Driscoll on his country's all-time list is an often under-rated opponent who will relish the challenge Sheridan presents. England: I Balshaw (Gloucester); P Sackey (Wasps), J Noon (Newcastle), T Flood (Newcastle), L Vainikolo (Gloucester); D Cipriani (Wasps), R Wigglesworth (Sale Sharks); A Sheridan (Sale Sharks), L Mears (Bath), P Vickery (Wasps. capt), S Shaw (Wasps), S Borthwick (Bath), T Croft (Leicester), M Lipman (Bath), N Easter (Harlequins). Replacements: G Chuter (Leicester), M Stevens (Bath), B Kay (Leicester), J Haskell (Wasps), P Hodgson (London Irish), J Wilkinson (Newcastle), M Tait (Newcastle). Ireland: G Murphy (Leicester); T Bowe (Ulster), A Trimble (Ulster), S Horgan (Leinster), R Kearney (Leinster); R O'Gara (Munster, captain), E Reddan (Wasps); M Horan (Munster), R Best (Ulster), J Hayes (Munster), D O'Callaghan (Munster), P O'Connell (Munster), D Leamy (Munster), D Wallace (Munster), J Heaslip (Leinster). Replacements: B Jackman (Leinster), T Buckley (Munster), M O'Driscoll (Munster), S Easterby (Llanelli), P Stringer (Munster), P Wallace (Ulster), L Fitzgerald (Leinster).